Like most kids, I was drawn to Jon Scieszka and Lane Smith’s The Stinky Cheese Man And Other Fairly Stupid Tales by its promise of gross humor. With a small man made of cheese who can’t get anyone to chase him because he smells so badly, that promise is definitely fulfilled. But the book became a childhood favorite because of how it flips classic children’s stories on their heads, avoiding the clunky morals that irritated me about fairy tales. It took me a long time to start appreciating classics—in books, movies, music, or TV. I’ve always had a rebellious streak, so the idea that I should respect a piece of culture simply because an adult told me it was a classic never sat too well. In college, I started to care about how old works shape and inform the new; but, even then, contemporary writers spurred my interest in literature. Although I took my disrespectful ideals too far, this irreverent attitude helped me think for myself. The Stinky Cheese Man encourages this mindset. The book begins with Little Red Hen announcing that she’s found a kernel of wheat. But Jack, the impish narrator, interrupts her. “You can’t tell your story right here,” he says. “This is the endpaper.” From the beginning, readers know that Jack’s characters exist outside of his control. The dedication page, which appears after the cleverly titled “Title Page,” is upside down. Jack assures us that he already knows about the mistake, but it doesn’t matter, because “Who ever looks at that dedication stuff anyhow?” Reading the book as a child, I laughed at Jack’s silliness, knowing on some level that this material throws his reliability as a narrator out the window, even though I didn’t have the language to articulate it. In the introduction, Jack says, “A long time ago, people used to tell magical stories of wonder and enchantment. Those stories were called Fairy Tales.” Then he flatly states, “Those stories are not in this book.” I loved this refusal to revere the classics. A play on “Chicken Little,” first story “Chicken Licken” follows a frazzled green chicken who’s convinced the sky is falling. The sky isn’t falling, though—it’s the table of contents that Jack forgot to include, and it squashes everyone in the story. “The Princess And The Bowling Ball” mocks the hyper-privilege of “The Princess And The Pea,” and third story “The Really Ugly Duckling” rejects the redemption of the original tale. Many of Smith’s illustrations in The Stinky Cheese Man are laced with a subtle malevolence, and the duck in “The Really Ugly Duckling” is captured with the tongue-lolling mania of mental-patient caricatures from early cartoons. My favorite part of this story, however, is the end. The maniacal duck doesn’t discover that he’s a beautiful swan. Instead, “he was just a really ugly duckling. And he grew up to be a really ugly duck.” Happy endings have become the go-to for kids’ stories. But coddling children with the idea that everything will always turn out fine is dishonest. “The Really Ugly Duckling” carries a more useful message about embracing personal quirks. Jack’s fallibility as a speaker is again emphasized in “Little Red Running Shorts.” Rather than just introducing the story like he’s supposed to, he gets too excited and blurts out the whole thing, after which the wolf and Little Red Running Shorts refuse to tell it again. The tale was slotted to fill three pages, so a blank page appears on the flip side. With the flaws in Jack’s book, as well as the trouble the narrator has controlling his characters, Scieszka and Smith demystify the writing process. Growing up, books seemed like artifacts that just existed, like they were created by otherworldly beings, a feeling that was reinforced by the overused vehicle of the omniscient narrator. But The Stinky Cheese Man pushes kids to think of books as human products—as pieces of culture they too can construct. “Jack’s Bean Problem” gets tugged back and forth between Jack and The Giant while also playing with text layout. “Cinderumpelstiltskin” and “The Tortoise And The Hair” end with the quotidian bluntness of “The Really Ugly Duckling.” The title story then inverts “The Gingerbread Man.” Unlike his cookie counterpart, no one wants to eat this little fellow. 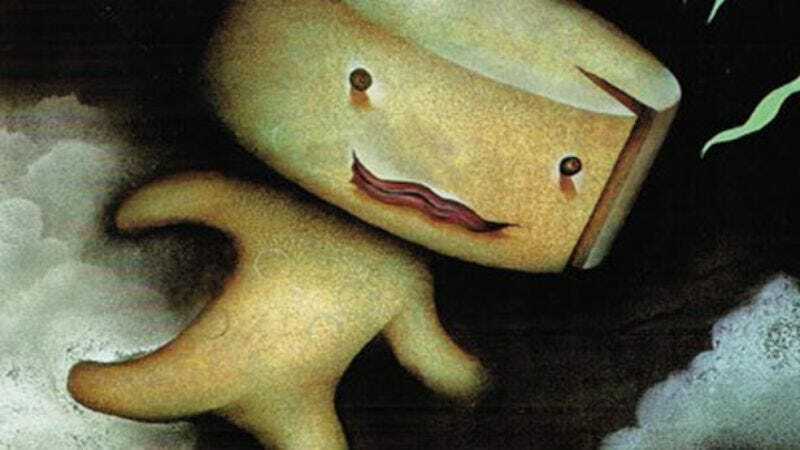 “The Stinky Cheese Man” finds momentum as much from its illustrations, which convey a similar ghoulishness as the characters in The Nightmare Before Christmas, as its text. A cow’s jaw unnervingly drops as if made of clay, and the fox’s toothy grin is the stuff of bad dreams. In the end, the small man made of malodorous cheese gets discarded into a river, where he falls apart. No lessons about not trusting strangers here: just a few lumps of cheese that dissolve in water. Critical thinking and skepticism seem like two of the most important qualities to instill in kids. They’re also some of the more elusive things to teach. There are no tables to memorize, no nursery rhymes to help children question what they’re told. These thought patterns are learned gradually, so books like The Stinky Cheese Man can stimulate the process of questioning pop-culture artifacts—and maybe even the world at large. Scieszka and Smith’s stories are also just entertaining, giving parents a healthy alternative to the good ol’ whiskey-in-warm-milk routine to put their kids to bed.